Super Star Clusters - Universe Galaxies And Stars Section. 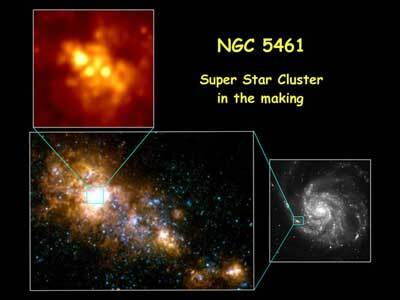 Super Star Clusters Started Small. The Hubble Space Telescope has helped to reveal a trio of massive, young star clusters which might have been formed by smaller clusters merging together. This tightly packed group of clusters were found in the active star forming region of NGC 5461 (located inside spiral Galaxy M101), which is located 23 million light-years away in the constellation of Ursa Major. These super clusters can contain the mass of more than 1 million suns, and it's believed that they're the precursors to massive globular clusters. In NGC 5461, the various clusters are distinct, but interacting with each other, and will eventually merge into a single, super cluster. A trio of massive, young star clusters found embedded in a star cloud may shed light on the formation of super-star clusters and globular clusters. Urbana-Champaign and Kelsey Johnson of the University of Virginia to the American Astronomical Society meeting in San Diego. This finding indicates that super-star clusters may be formed by coalescence of smaller clusters. The tightly packed group of clusters was found in the core of the active star formation region NGC 5461, within an arm of the giant spiral Galaxy M101. This Galaxy is located about 23 million light-years away in the constellation Ursa Major (the Big Dipper). "NGC 5461 has such a high concentration of light in its core that some Astronomers have thought it might host a super-star cluster," said Chu, who is a professor of astronomy at Illinois and principal investigator of the project. Super-star clusters, with a total mass of up to 1 million times that of the sun, are five to 50 times more massive than the spectacular R136 cluster at the center of the Tarantula Nebula in the Large Magellanic Cloud. They are believed to be the young counterparts of the massive globular clusters in our galaxy. Hubble Space telescope images of the core of NGC 5461 revealed a tight group of three massive clusters surrounded by a cloud of stars within a region about 100 light-years in diameter. Although each cluster is comparable to the R136 cluster, the total mass within this small volume is similar to that of a super-star cluster. "If NGC 5461 were several times farther away, even the Hubble Space Telescope would be unable to resolve this tight group of clusters," said Chen, a graduate student at Illinois. "It is possible that some of the super-star clusters previously reported in distant Galaxies actually consist of groups of clusters similar to NGC 5461." The large amount of mass at the core of NGC 5461 produces a strong gravitational field, causing the clusters and stars to move and interact dynamically. The rapidly fluctuating gravitational field produced by this interaction dissipates the relative motion of the clusters into random motions of individual stars. Eventually, the clusters and surrounding star cloud will merge into one single star cluster. "The Hubble Space Telescope images of NGC 5461 provide a unique glimpse of a super-star cluster in the making," said Johnson, a professor of astronomy at Virginia. "There is no super-star cluster yet, but it is just a matter of time." The dynamical evolution of the clusters at the core of NGC 5461 is being simulated by astronomy professor Paul Ricker at Illinois. Preliminary results show that under optimal conditions these clusters may merge within a few million years. "Fortunately, NGC 5461 is near enough, and young enough for us to resolve it with the Hubble Space Telescope," Chu said. "We were indeed lucky to catch it at such an opportune time." The work was supported by the National Aeronautics and Space Administration. The researchers will report their findings in the Feb. 1 issue of the Astrophysical Journal.